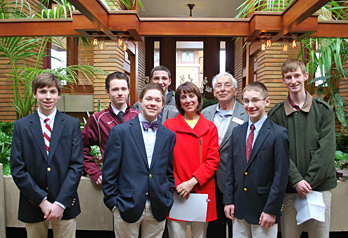 The Darwin Martin House offers tours and programs that relate to architecture, engineering, art, history, design and more. Tours can be tailored to fit your classrooms individual needs. Contact us today to hear more about any of our educational offerings. Thanks to the generosity of the Niagara Frontier Automobile Dealers Association, the Martin House is offering funding support for transportation for school learning trips to our site. Spaces are limited. Please contact us today to find out more information. Attention Title 1 Schools in New York State! Governor Cuomo launched the “Connect Kids to Parks” program to encourage teachers to bring their students to state parks and historic sites in our state. The program will reimburse up to $1,000 per class for transportation, tolls and fees. Schools do not need to pay for the bus or fees upfront; they only need to submit the transportation and site invoices along with the reimbursement form. Visit their site for more information, or call us for more information: 716-856-3858 ext. 206. School tours are recommended for grades 3 and up. Martin House Tour's are 1 hour, or 2 hours for the Martin House + tour. Tours can be shortened for younger school groups. Art Glass of the Martin House: Architecture is art! Explore the unique art glass windows at the site and create your own art glass template. Engineering past and present: Discover how the Martin House is an engineering marvel. Tour the house through an engineer's eyes and understand the unique design through either experimenting with geo-exchange or I-Beam construction. Haiku and You: Come and learn about the Japanese influence on Frank Lloyd Wright at the Martin House. Discover the wood block prints and Japanese elements of architecture. Students will understand the sentence structure of a Haiku and create their own, using the Martin House as their muse. Architecture SHAPES Our World: The built environment is made up of different shapes. Learn about the shapes through the lens of Buffalo Architecture and explore the many shapes in the Martin House. Create your own 2D structure on paper to take with you! We can coordinate an outreach program to your classroom which is a great way to introduce your students to the Martin House. Programs are one class period and can be used in combination with a tour (recommended) or as a stand-alone presentation. $75 per class. Are you looking for a unique program for your students or scout group? Think about the Junior Docent Program! In this three-part program, participants will learn about local history, gain public speaking skills and take a leadership role in the interpretation of this important local landmark. Contact us for more details. Are you looking for a unique professional development for your staff? Inquire today to find out about teacher workshops at the Martin House! Do you want to learn more about how local cultural organizations can help you in your classroom? Visit MECOB - Museum Education Consortium of Buffalo.